Ford makes some high-quality and beautiful vehicles. Yet, all it takes is one accident to twist a vehicle’s frame or seriously mar the exterior. Not only does that ruin the look of your vehicle, but it also threatens its structural integrity. Working with the right auto body repair shop in Mesa AZ can help you protect your investment in your vehicle and enjoy its beauty once again. Excel Collision and Glass Centers has numerous, conveniently located satellite locations throughout the Phoenix Valley, including a certified Mesa Ford body shop that can perform the expert Ford auto body repairs you need while offering friendly service and support. 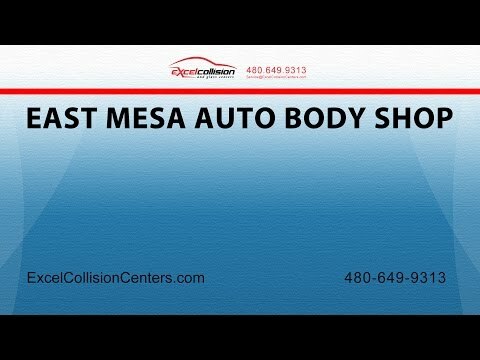 Excel Collision and Glass Centers has a certified Mesa Ford body shop as well as numerous other locations to make finding a qualified repair shop near your home or business easy. We maintain convenient hours so that more people are able to schedule an appointment during their busy schedules. We try to do everything we can to help you get a convenient appointment time so that you can get your car repaired with as little interruption to your routine as possible. We’ll also work to have your vehicle repaired as quickly as possible without compromising the quality of the repair. You’ll be back on the road fast and have a vehicle that looks as good as new. Excel Collision Centers understands how important your Ford car is to you, and that is why we provide high-quality Ford original manufacturer body parts to make your vehicle look like it was just delivered straight from the factory. Sometimes accidents happen, and if you find yourself in one, you can count on us to restore your vehicle to a pre-accident condition. We have convenient locations in Mesa for you to reach us without any waste of time. All our mechanics have extensive knowledge and skills to take care of all the repairs that a Ford vehicle needs after an accident. Our mechanics are able to complete even the most tedious task with ease. Excel Collision Centers works with all the insurance companies in the industry, so you can always count on us to restore your car. With positive reviews on Google, Yelp, and A+ on Better Business Bureau as well as our certification from Ford, we show how committed we are to every Ford car accident repair. Some Ford models have a frame made with steel, and other ones are made of aluminum. Because of these reasons, different tools and procedures are required for each material. Excel Collision Center has the knowledge, equipment, and skilled mechanics that can remove and repair any dent, crease, scratch, surface damage regardless of the model and year of your Ford Car. In only a matter of hours, you will receive your vehicle in “showcase” condition. You can’t take your vehicle to just any auto body shop for repair. You need to take your Ford vehicle to a shop that specializes in Ford body repair. Our Mesa team has received extensive training in the repair of all types of Ford vehicles, both old and new, ensuring that they can make any repair to factory specifications. Not only will your vehicle look as good as the day you bought it (at least in the places that have been repaired), but it will also be structurally sound and safe enough to protect your family again. You can trust in the quality of repairs performed by our certified Ford technicians. ✓ Performing the highest level of workmanship we can for seamless repairs. ✓ Providing honest estimates and only performing the work that is needed. ✓ Getting ongoing training to learn the best and newest techniques for getting results. ✓ Providing great customer service with a friendly attitude. ✓ Returning calls promptly and respecting your time. Our customers know they can trust our work because we show our commitment to these values in all our interactions with them. We encourage you to talk with some of our customers or to read our online reviews to see for yourself what others have to say. Call us today to make an appointment for your Ford body repair in Mesa. We’re ready to exceed your expectations.